The official Android emulator based on QEMU is really slow and makes me depressed, when it comes to testing real apps. So for that reason I was quite away from testing games development on this OS. Even Windows Mobile 6.5 emulator booted much faster :) Luckily I randomly found a Android-x86 project which tries to port Android for native desktop computers and laptops. You can find some screenshots on their Picasa web album. than on standard emulator. I was testing older Android-x86 1.6-r2 version which doesn't worked on a real PC. to keep using it on VirtualBox emulator only. Lets hope soon to have Android on native x86 architecture Netbooks and UMPC. 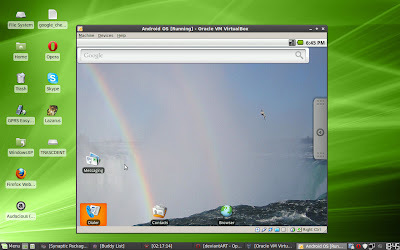 Running Android on VirtualBox on meh Linux Mint 9. © 2015 GintasDX. Theme images by friztin. Powered by Blogger.